that reads, at times, like science fiction." 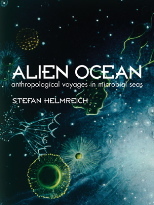 Stefan Helmreich's book Alien Ocean, Anthropological Voyages in Microbial Seas, has won the 2012 Rachel Carson Book Prize, given by the Society for the Social Study of Science to recognize a book-length work of special social or political relevance in the area of science and technology studies. Alien Ocean (University of California Press, 2009) has also received two earlier significnt prizes: the 2010 Gregory Bateson Book Prize, awarded by the Society of Cultural Anthropology, and the 2010 Senior Book Prize from the American Ethnological Society. "The 2012 Rachel Carson prize is awarded to Stefan Helmreich for his exceptional book Alien Ocean: Anthropological Voyages in Microbial Seas. We received many submissions, and read several wonderful books, but we were unanimous in recommending the award for a book that takes us—and takes STS—to what is probably the uncanniest place on the planet, the far depths of the oceans, where most creatures are invisible to the naked eye. This is a book that leads us into this alien world in the company of the scientists who research microbial life forms, and of all those who place their hopes in the hidden riches of the sea. This is, finally, a book that will change the way you think about nature and ecology; an anthropological study of the 'thickest' kind, that reads, at times, like science fiction. Please join me in congratulating Stefan for this achievement." When Stefan Helmreich set out to examine the world of marine microbiologists for a new book, his research took an unexpected twist. Helmreich, who has been recognized for his innovative cultural anthropology work, had decided to study scientists who chase some of the world's smallest creatures in some of the world's most forbidding places. So he spent long hours interviewing microbial biologists. But during the years of Helmreich's research, the entire field shifted gears. Alien Ocean immerses readers in worlds being newly explored by marine biologists, worlds usually out of sight and reach: the deep sea, the microscopic realm, and oceans beyond national boundaries. Working alongside scientists at sea and in labs in Monterey Bay, Hawai'i, the Woods Hole Oceanographic Institution, and the Sargasso Sea and at undersea volcanoes in the eastern Pacific, Helmreich charts how revolutions in genomics, bioinformatics, and remote sensing have pressed marine biologists to see the sea as animated by its smallest inhabitants: marine microbes. Thriving in astonishingly extreme conditions, such microbes have become key figures in scientific and public debates about the origin of life, climate change, biotechnology, and even the possibility of life on other worlds.